Little Khye turned 3 last week. This year's theme is Alphabet. Yes, this son of mine is quite a nerd. He loves ABC's and 123's. He recites them all the time! I decided on a small, plain chocolate cake with white fresh cream. This is so that the colours that I'm using will pop out. And also because I ordered 2 dozen cupcakes from Yours Truly so I think a small cake will do. 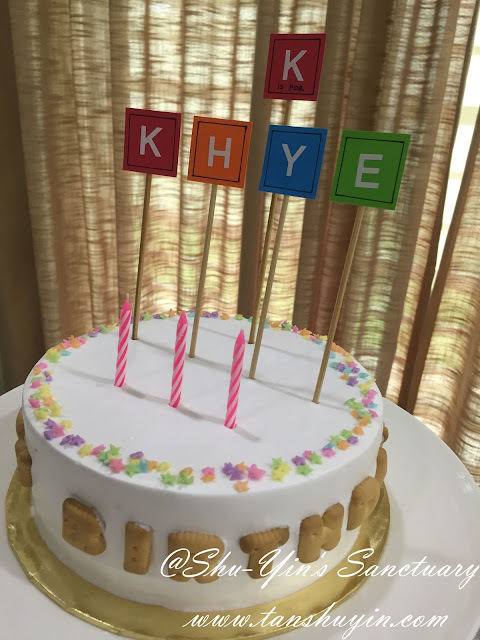 I used colourful cardstocks to make the letters 'K is for K H Y E' and adhered to satay sticks. On the sides I spelled out the word 'H A P P Y B I R T H D A Y' using the alphabet biscuits I bought. And I topped the cake with some colourful stars sprinkles at the rim of the cake. And of course the 3 candles. It was just a very simple cake, really. 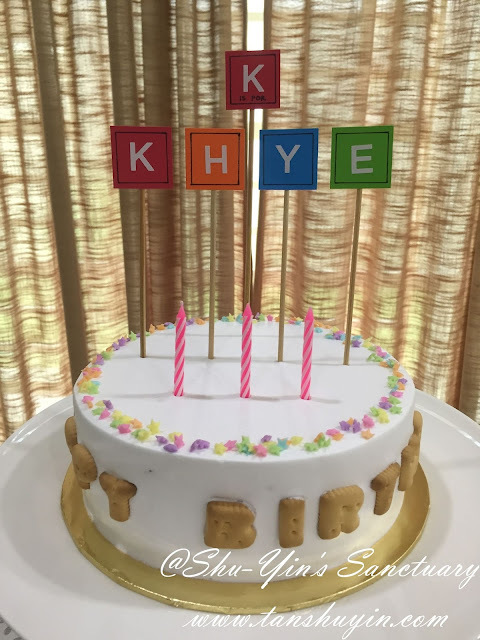 But it was an awesome One-Of-A-Kind Alphabet 3rd Birthday Cake for Khye! p/s - Click here to read about Khye's Celebration in his Playschool.p/s - Click here to read about Khye's 3rd Alphabet Party at Home.